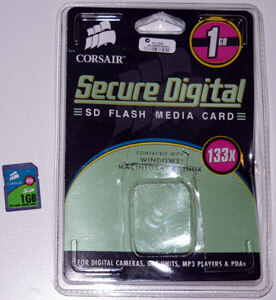 I recently purchased a 1 GB 133 speed Corsair SD card (model CMFSD133-1GB) because of my frustration with the slow write speed of my old Sandisk 1 Gb 32X speed SD card when taking burst (multiple consecutive) photos of moving objects such as wildlife. It came packaged in a small plastic storage case enclosed in a paperback book sized indestructible plastic case. If you want to use it immediately after buying it from the store you’ll need scissors or a knife to cut through this plastic. Long hailed as a performance leader in the field of computer RAM, Corsair has branched out with a range of new Secure Digital cards that are remarkably fast and reliable while being priced much more keenly than the SD card market leader Sandisk which charges a significant premium for its brand name. Rated at upto 133X speed these new Corsair SD cards have an impressive read speed of upto 21MB/s and write speed of upto 15.5MB/s coupled with a Lifetime warranty and the latest power saving technology to maximize battery life. These high-speed SD card’s are perfect for the pro-sumer and digital photography enthusiast who has a camera like mine (Panasonic DMC-FZ20) which can take advantage of the higher speed. To test the real-world speed when emptying the card I moved 965MB of photos (335 files in 4 folders) from the Corsair 133X 1Gb SD card to my computer using a USB2 SD card reader … this took 2 minutes 23.01 seconds which is quite impressive. However the real test is in my camera (Panasonic DMC-FZ20) which is capable of taking 2 JPEG photos/second in infinite burst mode … I was able to take 63×2.5 Megabyte JPEG’s or 10×14 Megabyte TIFF photos at ISO 400 in 30 seconds. Whether you need more storage for digital pictures, MP3s, your cellular phone or PDA, Corsair’s Secure Digital cards will deliver a lifetime of satisfaction. Corsair Secure Digital cards are available in a variety of capacities up to 2GB and are also available at cheaper and slower 60X and 40X speeds for use in devices that are not capable of high speed reading/writing to SD cards. Hi, just wondering where did you see the 1GB Corsair 133x SD card being sold for AU$17. I would like to get some. Thanks.